Genoil, the developer of the Ethminer fork with Nvidia CUDA support (source) has implemented some updates to the code of the project contributed by SP and tpruvot that reduce the load on the CPU when the miner is running. Also the default worksize has been increased form 64 to 128, but other than that there should be no changes affecting the performance of the miner. The reduction of CPU usage may come at the cost of slight hashrate drop, but there is a command line parameter now that you can use to stick with the higher CPU load and get the slightly higher performance --high-cpu-load, so it is up to you to decide. 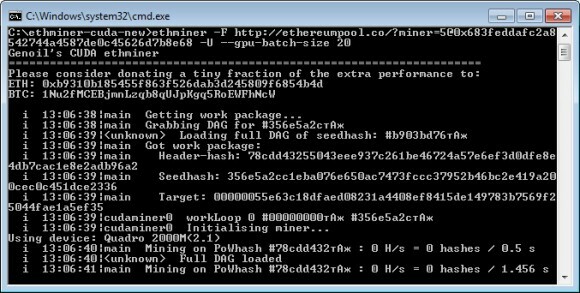 We have updated our package with Geth and Ethminer for OpenCL and CUDA with the latest version of the Ethminer CUDA binary for Windows (requires 64-bit Windows), so you can download and try it. The Ethminer CUDA fork should work on Compute 2.0 or newer GPUs, we have tested it with a Compute 2.1 and it is working fine, but don’t forget that you can run Ethminer in OpenCL mode as well on Nvidia-based video cards and not only on AMD if you are having trouble with the CUDA support or the hashrate you get is lower as compared to OpenCL.